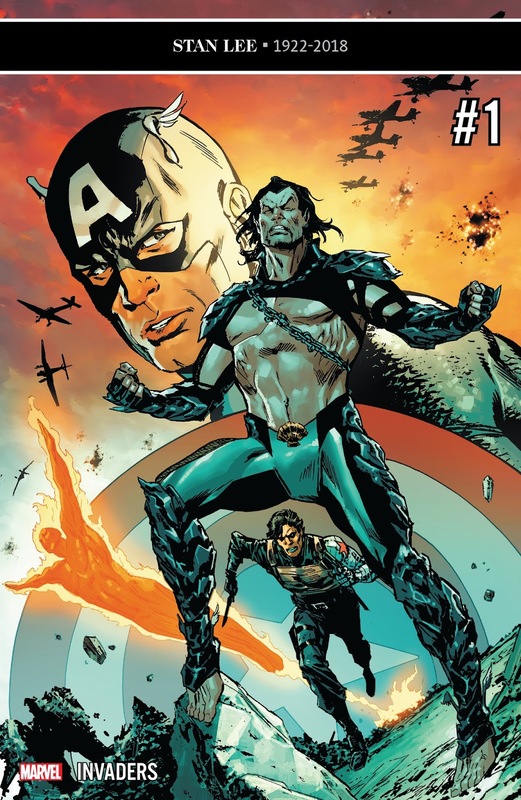 Matt C: Ever since Ed Brubaker gave us some WWII Michael Lark-illustrated flashback scenes during early issues of his seminal run on Captain America, I've had a hankering for a gritty, brutal take on the Invaders, something akin to Saving Private Ryan in spandex. This latest iteration doesn't quite deliver on my dream, as it jumps back and forth from contemporary scenes to war-ravaged 1940s France, but it comes pretty damn close and the angle it takes - of acknowledging the past and how trauma and conflict can shape those who experience it - was perhaps the element missing from my imaginings that I didn't realise I needed until now. The focus here is Namor and how his recent hawkish, violent posturings suggest he's readying to take on the surface world again with the full might of Atlantis at his command. Understandably his wartime colleagues - Captain America and Jim Hammond, the original Human Torch - are disturbed by this turn of events, unable to reconcile how their friend has fallen into warmongering. The flashbacks takes us back to the Second World War with the Sub-Mariner again in the spotlight, his hot-headed arrogance barely concealing his distress as his comrades are taken by enemy fire; he wants to think of humans as beneath his Atlantean superiority, but the deaths of ones he knows as friends hit him hard. Part of what makes this opening instalment so effective is how it embeds the bonds born on the battlefield, the connection between soldiers that most of us will (fortunately) never comprehend. They're tied together forever, and no matter where their trajectories take them, that connection remains near unbreakable. Chip Zdarsky applies just the right balance between lightness and darkness, moving us from the more realistic vistas of wartime France to present-day superheroic wonder with ease, assisted in no small measure by the artistic team. Butch Guice offers a grounded look at wartime starkness while Carlos Magno gives us more extravagant takes on wondrous undersea locales and super-powered beings in action alongside some quieter moments of reflection. Colourist Alex Guimaraes layers the panels with brightness for 'now' and then employs a more washed out approach for 'then', and it works perfectly.